The Picos de Europa (literally: "Peaks of Europe") is a range of mountains some 20 km inland from the northern coast of Spain, located in the Autonomous Communities of Asturias, Cantabria and Castile and León, forming part of the Cantabrian Mountains. The most widely-accepted origin for the name is that they were the first sight of Europe for the ships arriving from America. Cantabrian brown bears (Ursus arctos pyrenaicus), Iberian lynxes (Lynx pardinus) and wolves (Canis lupus signatus) live in the remoter regions. Rebeccos (Cantabrian chamois - Rupicapra pyrenaica parva) are fairly frequently seen (according to a 2006 Ministry of the Environment report, there were around 8,000 that year); Choughs and Buzzards are common and there is a diverse butterfly population in the park. Most of the region is now protected as a single Picos de National Park in Cantabria, Asturias and León provinces of Spain; the Asturian part was Spain's first National Park. Access is via minor roads to each of the three massifs from the north and from the south to the aerial tramway at Fuente Dé and to Caín at the head of the Cares Canyon. 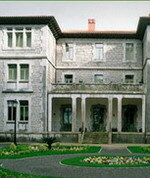 We are in an ancient palace of the XVIIIth century, and have provided the comfort of a family run guest house, while maintaining the charm of the building. 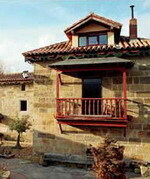 "La Casona de Lombraña" is located in the heart of Valley Polaciones one of the most peculiar of Cantabria; characterized by an unusual landscape, with abundant rainfall and strong relief. It is 104km. 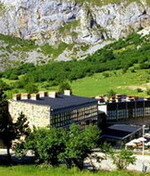 from Santander and near to the "Peak of Europe" with spectacular views, and is the ideal starting point for visiting the main attractions of the West of Cantabria. El Molino del Alto Ebro (The High Ebro Mill) is a solitary 16th century building which has survived to our days thanks to its oak and carved stone construction. It has been renovated respecting the original structure as far as possible but also installing all the latest comforts which modern technology offers. In the Molino del Alto Ebro you will be able to choose from a long and varied menu based on local products; our own baking and a well-chosen wine cellar : all of this in our large recently reconditioned dining–room to afford the maximum comfort for our guest. In an area of over 1,100 square metres, 7 spacious apartments of one, two and three floors have all the commodities a visitor could wish for with complete independence.